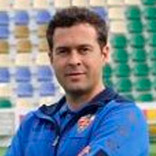 "Hello friends, I decided to be part of programme ProFútbol Analytics as soon as I found out that his project and its strength consists in being able to compare the results of our players of the same age, to a worldwide database. This aspect will enable us to evaluate if our work methods at the club level are as effective as in the rest of the world. Furthermore, at the individual level thanks to these evaluations, we are able to reinforce or redirect those physical-technical qualities that most need it."